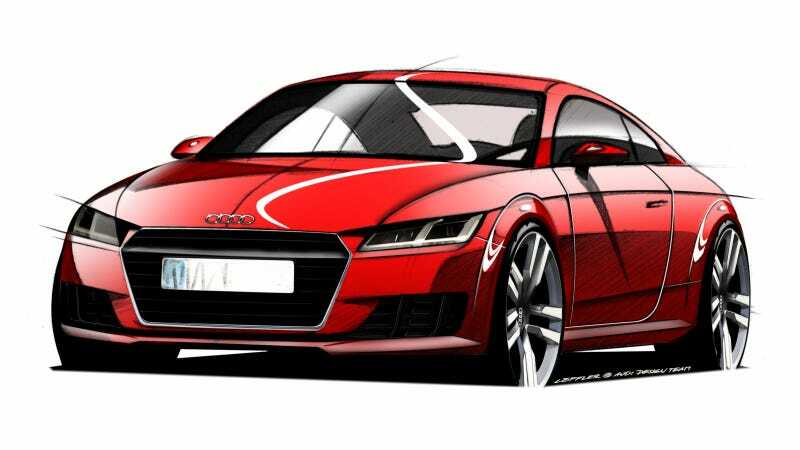 We now know for sure that the all-new 2015 Audi TT will make its debut in a few weeks at the Geneva Motor Show. Why? Because Audi says so! And to prove it, they sent this nifty sketch of what it will look like. Many details of the new Coupé's profile are reminiscent of the first generation's classic design. The sill contour forms a powerful light edge and the wide wheel arches constitute distinct geometrical entities. At the front, the wheel arch intersects the hood join, which continues over the door as the tornado line and extends all the way to the rear. The flat greenhouse looks like an entity in its own right. The shape of the C-post, with a slight kink, gives the TT a powerful, athletic look and enhances the impression of tension. There's also going to be a TTS model, Audi says, and it will have four tailpipes. Audi also confirmed the new interior will ditch the standalone infotainment screen tacked onto the dash for their Virtual Cockpit, which we're bound to see on future models too. No word on powertrains yet for the next TT, but it's a fair guess that it will be MQB platform-based with a variety of gasoline and diesel engines. I'm excited to see what they come up with at Geneva.